Includes a unique evidence-based calculator online that enables you to easily determine probability using likelihood ratios. Features a reader-friendly outline format, including dozens of "EBM boxes" and accompanying "EBM ruler" illustrations. Provides new evidence on the scientific value of many physical findings, including Cheyne-Stokes respirations, subclavian stenosis, fever of unknown origin, porto-pulmonary hypertension, localization of stroke, and many more. 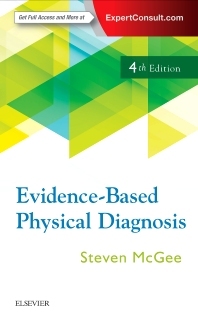 1 What Is Evidence-Based Physical Diagnosis?